Grades 2 and 3 Winter Program: December 13, 7:00 p.m.
Grades K and 1 Spring Program: April 25, 7:00 p.m. Here are links to clips from our December 2018 program. 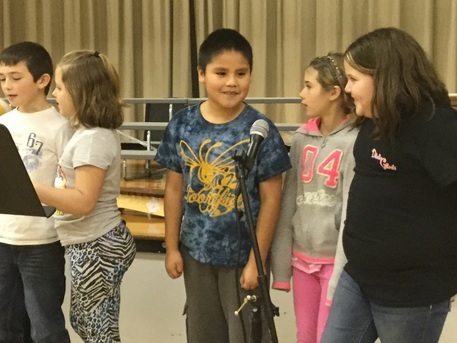 Students in grades 2 and 3 present a music program in December. Students in K and 1 present a program in April. All students participate in learning the music for the programs, which draw from a variety of sources to highlight a certain theme. Each student (gr. 2 and 3) is assigned a performance task beyond singing in the large group – perhaps coming forward to sing in a small ensemble, play an instrument part, or introduce a song. Each first grade class comes forward from the risers to accompany a song on the Orff instruments. Upper grade students have several ensemble options. Fourth graders may choose to sing in our school choir, Myers Melodies. This non-select group prepares unison and simple two-part music that focuses on developing in-tune singing and good choral sound. We perform for the school in December and take a field trip to a local nursing home in the spring. Fifth graders have the option of joining our Orff ensemble, M and M's. This group focuses on developing ensemble skills by playing mallet instruments (xylophones, glockenspiels, bass bars) and other classroom instruments. We will perform for the school in December and June and hopefully have an opportunity to perform in the community as well. January through March, selected fifth graders prepare to participate in the Rockingham County Choral Festival. Singers are selected based on interest, aptitude, and class effort. The festival choir is composed of singers representing each of the RCPS elementary schools and is hosted by our high schools on a rotation.